This contemporary styled and renovated period terraced cottage provides guests a very comfortable stay in the heart of one of the most historic streets in Winchester. Located on the Jane Austen walking Tour route, this property is set in the picturesque Kingsgate Village and makes you feel like you've stepped back in time - whilst being a stones throw away from Winchester's modern shopping centre and caf&eacute; culture. Just a few steps down the road is The Wykeham Arms, (winner of various Good Pub Guide awards) sandwiched between the Cathedral and the 14th century college; this luxurious country pub is surrounded by English heritage. The pub is noted county wide for its hearty food and will welcome you in on your return from the high-street markets or a treat back from the theatre, if you don't fancy cooking. On the ground floor of Pemberly, the lounge is furnished with large sofas in front of an inviting fireplace, perfect for those winter nights in. 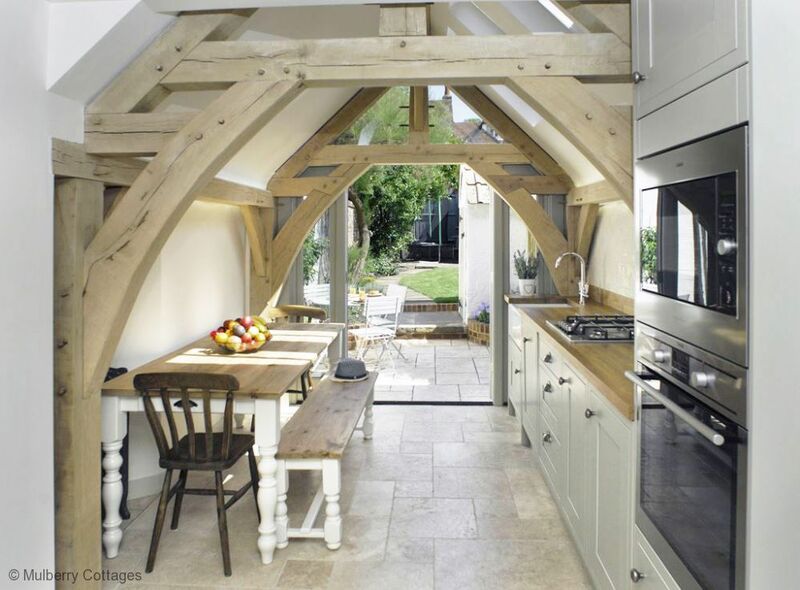 A separate magnificent kitchen and dining area, with a beautiful medieval styled arch, offers a cosy period setting combined with all the practicalities of a modern home including a coffee machine. Doors lead out to the unusually large garden with terrace, ideal for summer BBQ's and evening drinks. Designed with real passion and love, mixed with a flair for interior design, your stay in Pemerbly will not be forgotten. Upstairs is an elegant master bedroom with a luxurious double bed, antique fireplace and elegant lighting to really set the mood. A beautiful bathroom and second floor stairs lead to a cosy twin bedded second bedroom. This quintessential cottage is the perfect spot to base yourself in amongst so much heritage and character. If you want other friends and family to stay why not book The Potting Shed as only 20 yards away. Parking permit provided for local street parking. No smoking in this house please There is no toaster and electric kettle in kitchen for insurance reasons. Please use grill for toast! Please note this property can sleep a maximum of 4 people. Everything we needed for a great week in Winchester. A very comfortable, cosy cottage. Equipped with everything needed for an easy stay. And very clean! A little more info about which streets we were allowed to park on would’ve been helpful at the beginning of the week. Pemberly was an ideal rental in so many ways, from the location for great walks into town and runs along the Itchen, to the amenities (excellent kitchen, gas grill, washer/dryer) and finally the overall atmosphere of the house. I've rented twice in Winchester, this being the first at Pemberly, and as good as the first rental was, Pemberly exceeded that and will be my first choice for future Winchester stays. The beds were very comfortable. The space was terrific! It was not to small or crowded. At night the bedrooms were a little too hot. We didn't know how to change that. However, it didn't make the experience any less enjoyable! It was great to come back from a long day touring to a house where you can feel safe and comfy. The only thing I feel could have made it a little better was a shower curtain. Because we are not use to the shower being that way, we had to be extra cautious with not getting the floor wet. I would recommend this cottage to everyone!! Thank you for helping us have such a great experience!! Step outside to riverside walks that take you past Wolvesey Castle and lead you to the picturesque water meadows in St Cross, an idyllic place to have a picnic or let the kids have a run around. Or just a short 20 mile drive away you can visit Paultons Park and Peppa Pig World, great for all the family.